We are a leading manufacturer of top grade Girth Gears that have diameters up to 7000 mm. Our experts at Nishi Enterprise can also design and manufacture heavy gears based on the drawings that are provided. 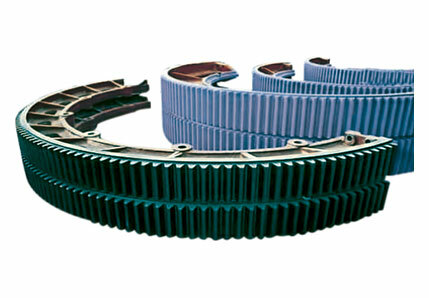 Our Girth Gears are used regularly in power plants, steel plants, cement plants and ball mills. While manufacturing our girth gears, we make use of a highly effective hardening process and this enables us to precisely manufacture products that always have a long life span. Nishi Enterprise has over the years developed a worldwide reputation by providing some of the finest quality girth gears that can be used in diverse applications. By making use of advanced technology, our diligent professionals can craft state of the art kiln girth gears and industrial girth gears that offer unmatched performance. Our girth gears are designed precisely with the help of high quality raw materials according to the "DIN 3962" standards of accuracy class VIII. The cast rims for the girth gears are created by the most reliable and trusted vendors in this sphere. We have a team of quality experts who check each and every product during the manufacturing process so as to make sure that they are in line with the international industrial standards. Here are some of the distinct features of our girth gears. The extensive line of girth gear products that we design and manufacture enjoy a widespread demand across different industries and are used alongside different machines like Rotary Dryers, Rotary Kilns and Ball Mills. Moreover, we can produce our girth gears based on different specifications that are provided to us by our customers. So if you are looking to customize girth gears for your specific needs, you can certainly get the finest products from us here at Nishi Enterprise. We also have an extensive panel of girth gears that are constructed based on standard measurements. Our proficiency in making state of the art girth gears really makes us some of the best in the industry. We always adhere to the best industry practices while we are making our girth gears. Our girth gear products are also available at the most affordable packages.